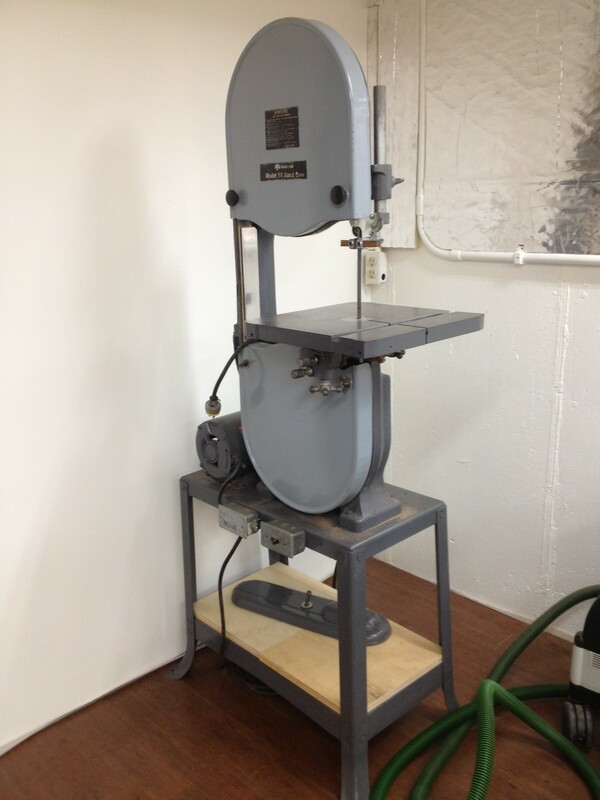 A few weeks ago, I had a fellow member of the St. Louis Woodworkers Guild come over and help me tune up my late-70’s Rockwell/Delta bandsaw, a project that was some five years in the making. I bought the saw back in 2008, from the wife of my first woodworking mentor, who passed away in 2007. I probably spent too much for what I got, but I knew the money was needed, so I happily paid her asking price. But when I got it home and started it up, the bandsaw vibrated so much I almost couldn’t use it because I couldn’t see the blade properly! I spent an hour one day checking it over to see what I would need to do to it to get it back in working condition. I noted both wheels had been balanced, which was good, but there were several things I thought I could do to improve performance. I jotted them all down, along with some dimensions I would need, and then started looking for a place from which I could buy replacement parts. I’m not sure who originally turned me on to the company (it might have been my first mentor, funny as that would be), but the first place I was told to contact was Iturra Design. They said it would cost me a few dollars ($8, I believe), but I was told it was completely worth the cost. So I called and had them send me a catalog. And it was worth the price! I wouldn’t call it a catalog so much as a treatise on how to tune up your bandsaw, that thing is so full of information! Of course, it also has information on any and every part you might need to replace on a bandsaw. Though it lacks a Table of Contents or an Index (at least my version does), it was not too difficult to navigate. I found everything I was looking for in no time and called in my order. From what I can remember, shipping was quite fast and I had the parts within a week. Unfortunately, time mismanagement turned into procrastination and procrastination turned into a forgotten project; so there my bandsaw sat, untuned, for about five years. Honestly, I didn’t really miss it all that much. When I needed it, I made do with what I had. But when I took Matt Cianci’s Build A Backsaw Class a few weeks ago, I had the opportunity to use an old Rockwell bandsaw to rough out my tote. Man, was that nice. It made me want to get mine running again, so I called Dan, a guild member who was a retired high school shop teacher, and asked for assistance. He offered to come over on a Saturday and help get my saw back in working condition. He showed up a few weekends later and looked over the bandsaw first thing. Then he said we could do some stuff to it that day, but we’d need to order a few parts in order to make most of the changes it needed. I said, “You mean these parts?” and pulled out the box from Iturra Design. We looked through them to make sure I’d ordered the right parts (I had) and then got to work. About 90 minutes later, we’d replaced both aluminium pulleys with cast iron versions, changed out the guide holder (the old one had been modified to hold custom circular steel guides), replaced the thrust bearing, switched the old tensioning spring with a high-tension spring, removed the cracked rubber tires and added new urethane bandsaw tires, mounted a wheel brush, and tossed out the old belt in favor of a Powertwist Link belt. When it came time to put new guide blocks in, Dan peeked in the shipping box, then turned it upside down, looking for the replacements I’d ordered. But I hadn’t ordered any; instead, I pulled out a small ½” thick block of quartersawn lignum vitae and told him I wanted to use wood, instead. He shrugged his shoulders, took the block, and went over to the tablesaw to cut some blocks to size. He cut the entire block of wood up into blanks, which left me with a few spares, should I ever need them. After a quick cut with a miter saw for one of the bottom blocks, he installed them and we were ready to give it a try. 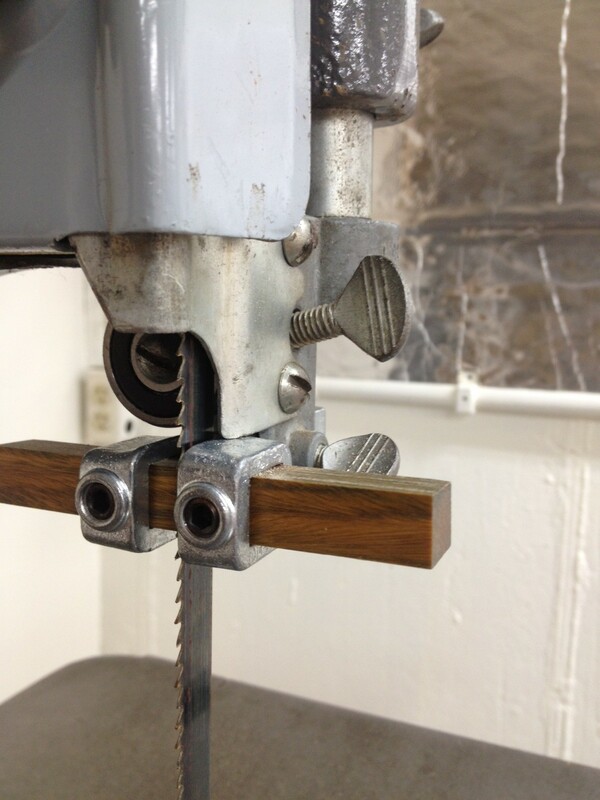 Upon startup, the saw was still a little loud for my tastes, but… the vibration was completely gone. We ran a few test cuts through and noted there was no measurable drift in the cut and the surface it left was quite smooth – nothing a few swipes with a jointer plane wouldn’t clean up. After Dan left, I removed the saw from the base and carried all the pieces down to the basement and re-assembled it in the workshop. It is one of the few power tools I’ll bring into the shop (the other being the drillpress, which will require disassembly for moving, as well). I’ve had a chance to use it a few more times since I moved it down, and I am still 100% pleased with the improvements we’ve made. The only thing I might still modify is to mount it up on hockey pucks to further reduce the vibration (and keep the feet of the base from digging into my cork floor). 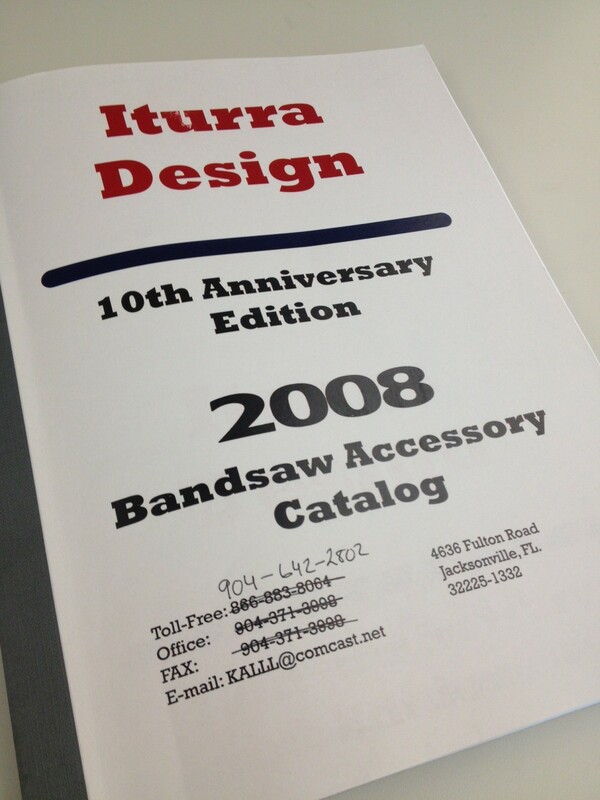 If you are looking to make upgrades to a bandsaw you currently own, or want some great advice/information on what bandsaw to purchase before you buy, you should definitely pick up an Iturra Design catalog. You can reach Louis by phone at 904-642-2802 or by e-mail at KALLL@comcast.net. Very cool! Bet you’re going to love having this tool around and all the insider knowledge you have from bringing it back to life. Thanks also for the insider’s band saw knowledge fount. BTW, I looked around your site and didn’t find a picture of your workshop. Really? That’s weird. I’ll have to… OH, LOOK! It’s a jackalope! *sigh* OK… I’ll try to get some shop photos taken and load them up. It’s terribly boring at the moment, I must say, though. I have lumber purchased for making some tool storage/hanging solutions, but have not done anything with it yet. I’ve started to prioritize some of the unfinished projects in an effort to get them done. The whole working-from-work-on-my-lunch-break bit is helpful, if somewhat limited. Right now, the top of the list is a box I’m making for my wife; once that is done, I’ll get back to shop stuff (bench, sawbench, storage, etc.). But I can post a few “in the mean time” pictures… They will be under the About Me section.